The year is not yet half past and there have already been seven documented multi-stage foodborne illnesses. The most recent involved eggs in their shells contain salmonella and packed minced romaine lettuce contaminated with the particularly dangerous "hamburger beetle" E. coli 0157: H7. With summer and its accompanying picnics and outdoor food festivals, more outbreaks are likely to diminish the enjoyment of unsuspecting guests this year. We live in a global food economy, and most people buy and consume foods that are packaged in large quantities thousands of miles away to simplify the preparation of food at home and in restaurants. Meat, poultry and fish can come from huge farms Thousands of animals are reared together, increasing the likelihood that foodborne organisms will spread widely before they are discovered. More than 40 million cases and 3,000 deaths are caused each year by food poisoning in this country. Every sixth person usually gets sick every year, according to CDC, and the problem worsens. The cases are no longer primarily related to food prepared with raw eggs (such as homemade mayonnaise and eggnog) or uncooked meat and poultry. Harmful organisms now appear in foods that were not considered a problem years ago, such as raspberries, melon, ice cream, salami, shallots, parsley, cider and even toasted oat cereals. You can protect yourself up  to a point if you take reasonable precautions with the foods you buy. Most important: Keep hot food hot and cold. If you want to refrigerate a food, do not store it for more than 40 degrees Fahrenheit, from store to house – for a maximum of an hour or two. In hot weather or a sun-drenched vehicle, transport the food in a cool or insulated bag filled with ice. Once you're home, store food safely. Never put raw meat, poultry or fish in the fridge where it may drip on other foods, especially already cooked foods and fresh, raw fruits and vegetables. Do not thaw frozen foods on the counter. Remove it from the freezer in time to allow it to thaw in the refrigerator or use a microwave oven with defrost function. Food safety experts advise against rinsing raw meat, poultry and fish in the sink; There is a risk of spreading harmful organisms on surfaces that later come into contact with raw foods. However, even if you intend to peel or cook them, products can and should be washed unless they are packaged in a triple-rinsed or pack ready for use. Rinsing on the other hand risks cross-contamination. Be doubly sure to wash melons, especially melon and others with rough skin, before cutting into them to transfer evil organisms from the surface of the fruit to the flesh in it. But experts do not recommend using soap or bleach on food. Do not assume that the food, as it is grown locally or from the farmer's market, is free from potential hazards. Large producers work under strict rules to prevent contamination; small local farmers may not live up to the same conditions. Before cooking, wash your hands with soap and warm water under your fingernails and up to your wrists. Use a commercial detergent or a solution of one teaspoon of bleach in one liter of water to clean the kitchen surfaces. If you are preparing food, use separate chopping boards and knives for raw pet food and produce, even produce you plan to cook. Wash the appliance thoroughly with soapy water between the two. Foods that are marinated should always be refrigerated, even if the marinade is sour. Never use the same marinade after cooking on the food – unless you first cook it for 10 minutes – and do not use it again to marinate anything else. Cooking animal products to the right temperature: 160 degrees for minced meat; 165 for poultry; 145 for pork and fin fish; until the pulp is opaque to most clams and shells are open to clams, oysters and clams. After a meal is cooked, put it on a clean plate. If you are organizing a buffet and expect raw or prepared food to remain uncooled for hours, use a portable burner (such as a chafing dish) to keep hot food hot and put crushed ice on cold food. But no matter how carefully you handle eating at home, it's difficult, if not impossible, to reduce the risk of food poisoning if you rely heavily on food prepared in the restaurant. All it takes is a grocer along the line who houses a harmful organism and makes no provision for contaminating the food that is being prepared and served. However, they may help protect others. If you have a good reason to suspect a particular source of your resulting misery, you can restrict its spread and prevent others from becoming ill by sharing your experience with your local Ministry of Health and the facility, as soon as possible who work, report bought or consumed the food. That said, locating the cause of a food poisoning event can be very difficult. It may or may not come from the last food or drink you have consumed. Different organisms take different amounts of time to produce symptoms that can be considered as food poisoning, and the "transit time" that the food travels through the digestive tract varies from person to person. And if you want to know how efficient your digestive tract is normally, eat a corn cob and notice how long it takes to pick up undigested grains in your stool appear. This could help you locate the source of suspected food poisoning. 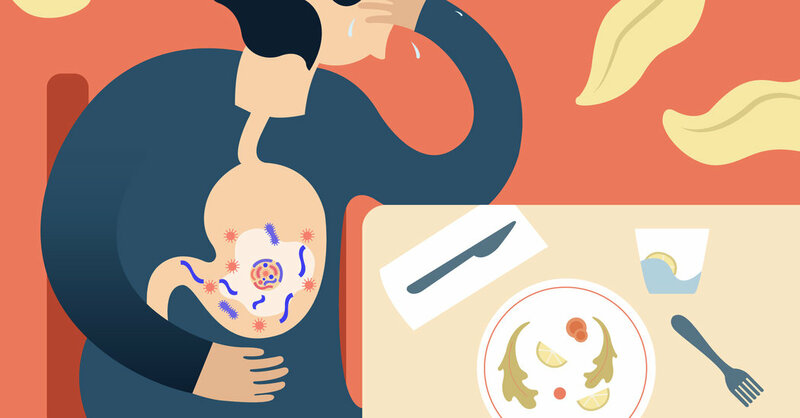 While the most common symptoms of food poisoning are vomiting and diarrhea, several organisms – Shigella, Yersinia and Clostridium perfringens – cause only diarrhea and a serious infection. Listeria monocytogenes are predominantly fever. A hospital lab may be able to quickly identify the cause with a DNA test on a stool sample. For more guidance, consult the website FoodSafety.gov.